7. Trollius L., Sp. Pl. 556. 1753. Gen. Pl. ed. 5:620.1754, Boiss., Fl. Or. 1:59.1867, Hook.f. & Thoms. in Hook.f., Fl. Brit. Ind. 1:22.1872, Huth in Helois 9:1-18.1891, Shipchinskii in Bull. Jard. Rot. URSS. 28:55.1924 & Fl. URSS. 7:42.1987, Tamura in Kitam. (ed.) Pl. W. Pak. & Afghan. 66. 1964, Stewart, Ann. Catalogue Vasc. Pl. W. Pak. & Kashm. 277. 1972, Qureshi & Chaudhri in Pak. Syst. 4(1-2):29.1988. Perennials with usually 1-flowered stems. Leaves palmatipartite with pinnatisect segments, mostly radical, the few stem-leaves alternate. Flowers regular, hermaphrodite. Sepals 5-20, petaloid, deciduous after flowering, yellowish to orange-yellow. Petals in irregular numbers, much shorter than sepals, with a nectar groove near the base. Stamens numerous, sessile or on an elevated receptacle. Mature follicles with several globose to irregularly triquetrous seeds. A genus of c. 25 species in the northern temperate and arctic zone, in the southern part of its range, mainly confined to higher altitudes. Represented in Pakistan by 1 species. Trollius pumilus auct. 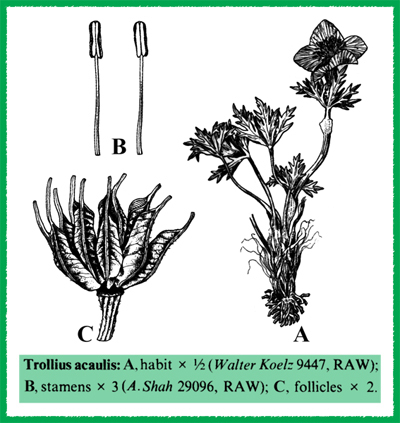 non D. Don = Trollius acaulis Lindl.